I was there tonight. It was special and emotional. We were 32 lucky fans who happened to be at the right place at the right time. 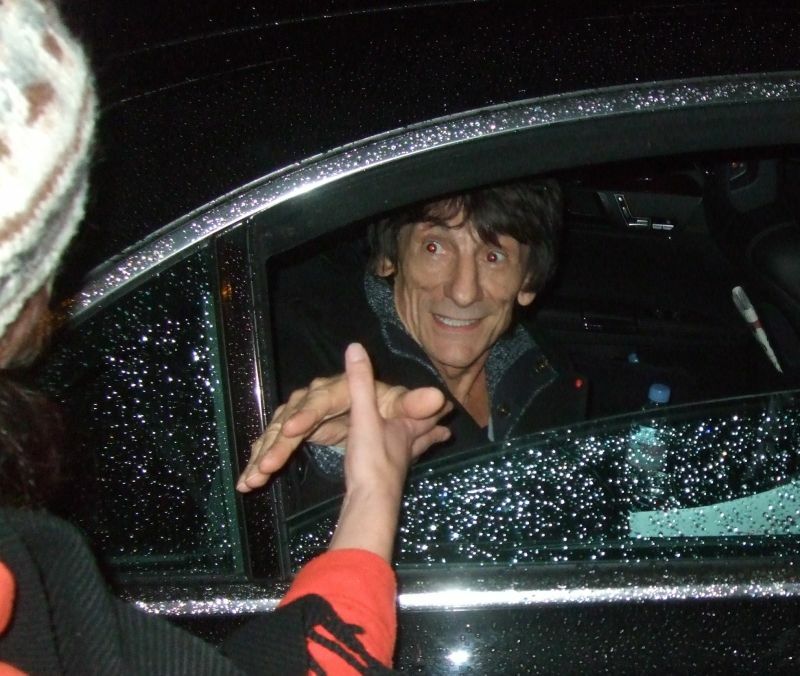 Thanks to the Rolling Stones for taking so much care of their fans. It was a rare moment and first in history I think. First I was not sure if I could or should write anything about tonight. The moment felt private. Intimate. But then I am thinking about the two million Rolling Stones fans who visit my site IORR.org every year. They could not come today. We were 32, and I want to share my memories and excitement with friends and all other Stones fans, all over the world. To tell you about a moment in Stones time that made time stand still for an hour or so. I have been dreaming of this moment for 41 years, ever since I bought my first Rolling Stones record in 1971. To see the band I love so much in the studio, how they work and rehearse to make the songs work. And just as I was about to give up on this dream, I was inside today, listening to "That's How Strong My Love Is". There were tears in my eyes. I was thinking of the moment at Roseland Ballroom in New York City ten years ago, when this song gave me the same emotions, but now it was so much stronger. The band was right in front of me, Mick was not stressed by being the greatest. He was doing a more emotional performance, going deep, slow, voice far from microphone, then closer, then almost whispering, and all of a sudden he exploded, just like in Roseland. It is all happening so quickly. The Rolling Stones have decided to give something back to the fans who wait patiently outside the rehearsals. We are there for hours. We are lucky when they roll down the windows and wave to as as they come and go hour later. In-between we get to talk about everything, keep warm in freezy Paris, not like Toronto summertime. They open the gates, but there are no cars to go out or in. There are more security guys than normal. I know the same moment they come what this is about. From that moment on and for the next hour my heart do not have any resting beat at all. My entire body is on alert. Something very, very special is coming. They take us to a small balcony right in front of the rehearsals stage. We are a few meters up i.e. 15 feet or so up, and there is just a sitting group between us and the Stones. 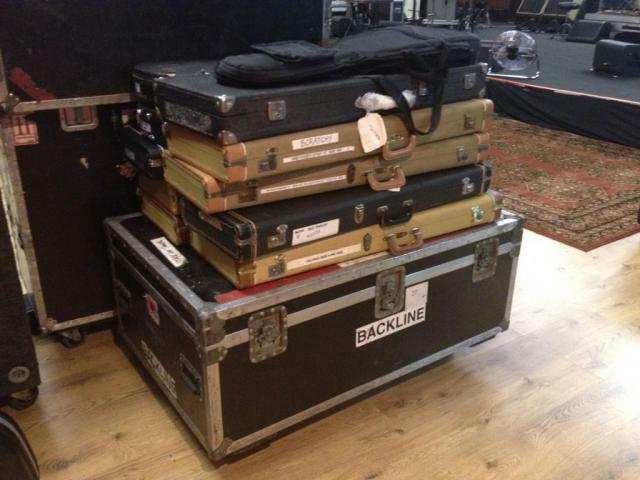 There is a bunch of guitar cases spread around in this large room where they are rehearsing. We are told to be nice, "Don't do anything stupid". I am fast up and on the rail which we are told not to touch. Perfect view. The band is right in front of me. Fifteen minutes ago I was outside freezing and now I am facing the band of my life. Live With Me is first. The guitar sound is so sharp they are cutting the air. 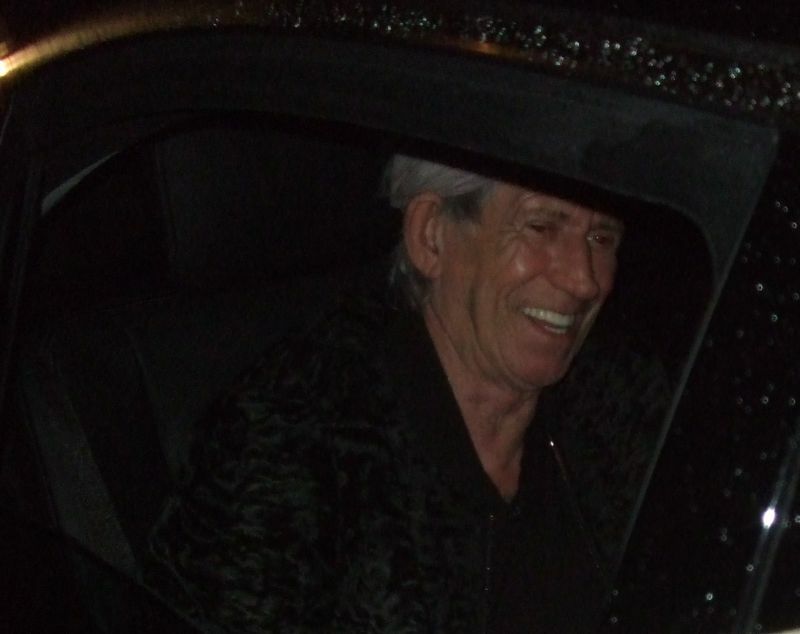 Ronnie and Keith are cool and smiling. They work on the song and make sure it is right. Chuck and Mick discuss starting and ending and bridges of songs. You might say that Chuck is doing a lot of the band leading, but just as much Mick is starting and stopping and making sure this is getting perfect, as well as Keith, also Ronnie at times. This is teamwork. One More Shot - The new song and we get it on the day of it's release. They discuss how to start it. Mick is reading the lyrics from his Mac. They do it one time. Working on the finsihing part. They do it again. And again. In the end they are happy. And I am happy. This is still so unreal. There is an applause as they finish every song, but I think they are at work so may be they do not like us applauding. They were a bit stressed on the first song, but after five minutes they work like we were not there. No Expectations is next. Mick with an acoustic guitar. I love this song. So great to just watch and absorb. No worries about the guy next to me spilling beer or singing loud. This is the Stones at work, at their best. Then I start thinking about the time. They told us we would get half an hour. I hope they forget about the time. Please. Not yet. I want some more songs! Worried About You with Mick on keyboards next to Chuck. The falsetto. Then he is moving up to the center stage. They are doing another great version of this song, and every time I hear it live I call myself lucky, as it is so rare if you go to one show per tour only. That's How Strong My Love is and my emotions are taking over. I am thinking how strong my love is for this band. A love so strong it is taking me all over the world to follow all their shows and all they do, and how nice people have been to me in order for me to fulfill this great and strong power inside me. Not since Roseland I have felt this strong. Just like they talk about "The perfect storm", this is my perfect Stones moment. Just like at Roseland when I first got " She Smiled Sweetly" and soon after "That's How Strong My Love Is". 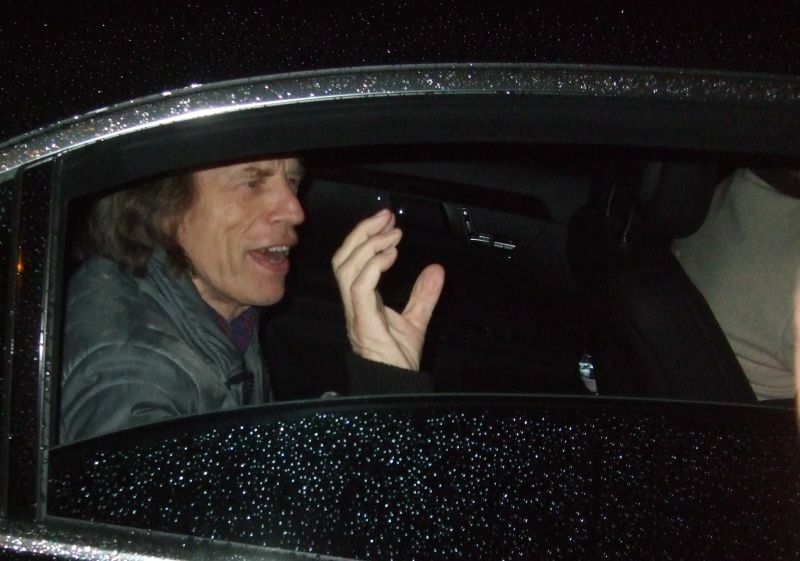 One hour ago I was outside listening to two takes of my favorite Stones song "Memory Motel" with two takes. And now this. Again. I look around me here on the balcony and there are 32 smiling faces with similar emotions. At the end they get an even longer applause, I am a bit embarrised but I do a quick and soft applause in case they think I did not like it if I did not applaude. But I am just here to see them work, not to bother them. Still I think they like us applauding. They do smalltalk to us like they never do live and I think this is a great and special moment for them too. They work hard on the second start i.e. the restart of this song, doing several takes. The whole point is to stop and then restart the song in a perfect way. Charlie work on the feedback he get from Mick, Keith and the others, they do some extra takes but the final one is just as we would like to hear it later this month at the O2, or in December in Newark. Little Red Rooster - Time for some blues. Keith has been great with lots of playing through "our" set, and Rooster is no exception. Another great version, and this time in such a special room. Mick says thank you everyone. I can't understand it. We all say thank you see you in London. Ronnie, Keith and the rest of the band say goodbye. I don't want to go but they said we should be nice. I am thanking everyone I know for being kind. I am on another planet, just like the rest of us. We walk down and pick up our jackets. No big queue, we are just 32 people. Then outside. We are all on another planet. The Stones keep reherasing two more songs, but nobody listen. We talk talk talk. We phone the ones we love to say thank you and to tell about our moment. We are all smiles and I do say to myself I have to write down everything to assure myself this was not just another dream. I have so many dreams but at least this one came through tonight. PHOTOS: All photos above taken by Bj�rnulf Vik - IORR. 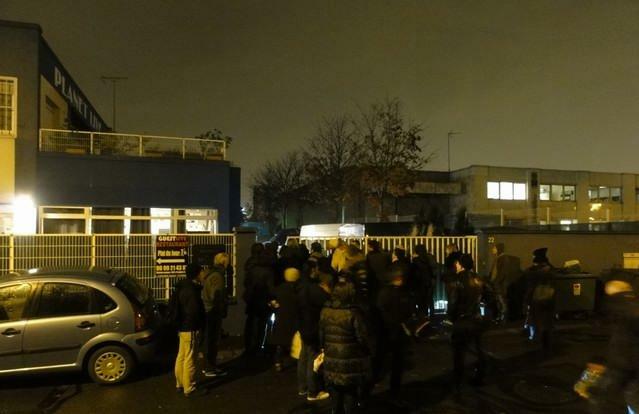 The pictures are taken in the order they left the rehearsals on the final day in Paris on Friday November 9, 2112. I.e. the day after they let in the fans to the rehearsals. They all seems to be very happy to see the fans waiting outside, and the fans were all taking pictures and shaking hands, very different from the previous days and weeks. .. I scanned the whole place, trying to memorize it forever, there were four large sofas, the rugs that were seen on the promo shots posted on twitter, a very old tape recorder on a table, newspapers, nothing was hidden...the crew was looking at us, some seemed quite moved too, others were staying focused, on the studio floor and on the mezzanine. Clearly they were taking a bit of a risk letting 32 people in that they didn't know even if some faces were very familiar by now, if something went wrong during this impromptu event a few weeks before some crucial concerts it would certainly be no end of trouble for them. The Stones were working as if we weren't around, Mick, Ronnie and Keith huddled together before the start of "One More Shot" to hum Ronnie's guitar part in the intro, they restarted some transitions several times like for the second chorus on OMS and Keith signaled to us good humoredly when Mick forgot one part...or during "That's How Strong My Love Is" when they told Charlie several times how they wanted him to slow down before they restarted the song...I almost felt we were almost prying on them in these intimate band moments but if it worked for them, fine with me! In the end we stayed 52 minutes on the mezzanine and it concluded with Mick thanking us for our support, for standing outside for hours, saying he didn't understand why we did that, people saying thank you, thank you for the Trabendo, and he replied "this was a mini-Trabendo", we said "see you in London", a Japanese fan who flew in for the rehearsals said "see you Japan" and he chuckled...a last peek before going down the stairs, the maze of corridors, I bumped into a cable canal, back into the lobby, we hugged, it was over, we headed out, shook hands with the crew, thanked them. PHOTOS: The photos number two and three were taken by Guillaume - gotdablouse. The first one is from the Rolling Stones own twitter pages.